Born 26/01/1889 at Coventry. Wife of Albert G Adams. Mother of Hilda Adams. Housewife. Resided 49 Castle Street, Coventry. Killed in the October Raids 19/10/1940 Aged 53 at 49 Castle Street. Buried London Road Cemetery, Coventry. Born 1872. Killed in the Coventry Blitz 14/11/1940 Aged 68 at 83 Trafalgar Street. Employed London Midland Scottish Railway Company Limited, Coventry Goods Department, Castle Street. Buried London Road Cemetery, Coventry. Born 31/12/1918 at Coventry. Daughter of Albert G Adams and Annie Maria Oldfield. Resided 49 Castle Street, Coventry. Employed Armstrong Siddeley Motors Limited. Killed in the October Raids 19/10/1940 Aged 24 at 49 Castle Street. Buried London Road Cemetery, Coventry. Born 05/10/1879 at Montrose, County Angus. Wife of William Thomas Adams. Resided 17 Springfield Road, Coventry. Killed in the Coventry Blitz 14/11/1940 Aged 64 at 17 Springfield Road, Coventry. Buried in the Communal Grave, London Road, Cemetery, Coventry. Born 03/01/1885 at Barrow in Furness. Husband of Mary Brand Connigale. Resided 17 Springfield Road, Coventry. Employed Armstong Whitworth, Bagington. Killed in the Coventry Blitz 14/11/1940 Aged 60 at 17 Springfield Road, Coventry. Buried in the Communal Grave, London Road, Cemetery, Coventry. John Lovell Ager was born in 1877 at Aston, Birmingham. The son of John Ager and Jane Withers. Brother of Alfred Ernest Ager. Husband of Ann Marie Hancox. Resided at 149 North Street. Injured in the Coventry Blitz 14/11/1940 at 149 North Street died four days later at Gulson Road Hospital, 19/11/1940 Aged 62. Buried in the communal grave at London Road Cemetery, Coventry. Born in 1880 at 67 Coventry Street, Stoke Coventry. Daughter of James Hancox a Silk Weaver and Hannah. Wife of John Lovell Ager. Resided 149 North Street. Housewife. Killed in the Coventry Blitz 14/11/1940 Aged 59 at 149 North Street. Buried in the communal grave at London Road Cemetery, Coventry. Resided 137 Sullivan Road. Killed in the Coventry Blitz 14/11/1940 at 137 Sullivan Road Aged 32. Buried London Road Cemetery, Coventry. Born 16/09/1902 Coventry. 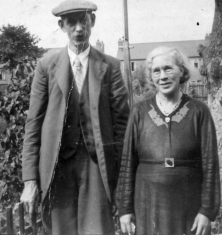 Son of David John Alexander and Alice Mary Woodward of 29 Walsgrave Road. Resided 29 Walsgrave Road. Employed as a Mechanic at Tutton Brothers. Fireman in the Auxiliary Fire Service. Injured in the April Raids 11/04/1941 Died 25/04/1941 Aged 38 at the no. 1 Canadian General Hospital, Marston Green, Coleshill. Buried Meriden. Born 23/09/1920 at Warton, Tamworth. Daughter of Joseph Henry Alcock and Amy Elizabeth Poultney of 117 Abbey Cottages, Binley. Sister of Amy, Joseph, Edna, Reginald and Iris Alcock. Resided 117 Abbey Cottages, Binley. Employed Humber Hillman Limited. Killed in the April Raids 10/04/1940 Aged 20 at Stoney Stanton Road. Buried in the Communal Grave, London Road Cemetery, Coventry. Wife of William Allen. Resided 15 Mansel Street, Foleshill. Killed in a November Raid 21/11/1940 Aged 61 at Abbey End Kenilworth. Husband of Charlotte Allen. Resided 15 Mansel Street, Foleshill. Killed in a November Raid 21/11/1940 Aged 63 at Abbey End Kenilworth. Born 18/11/1873 at Leamington. Daughter of the late William Allitt a Butcher and Maria, of 34 Ranelagh Terrace, Leamington Spa. Sister of Jane who was killed in the Coventry Blitz 14/11/1940 and Alice. Resided at 60 Whoberley Avenue. Died 13/04/1941 in Hospital as a result of being buried within Warwick Row Shelter when it collapsed, buried London Road Cemetery, Coventry. Daughter of the late William a Butcher and Maria Allitt, of 34 Ranelagh Terrace, Leamington Spa Born 25/05/1871 at Leamington Spa. Sister of Elizabeth who was killed in the April Raids and Alice. Resided at 113 Much Park Street Coventry. Killed in the Coventry Blitz 14/11/1940 at 113 Much Park Street Aged 68 buried London Road Cemetery, Coventry. Born 16/09/1880. Widow of Alfred S Allport. Mother of Phyllis Marguerite. Resided at 43 King Georges Avenue Foleshill. Housewife. Killed in the Coventry Blitz 14 or 15/11/1941 Aged 60 at the Foleshill Union Shelter. Buried in the communal grave at London Road Cemetery, Coventry. Born 03/08/1918. Daughter of Alfred Allport and Clara Tallis. Resided at 43 King Georges Avenue Foleshill. Clerk Typist for Alfred Herbert Limited. Killed in the Coventry Blitz 14 or 15/11/1941 Aged 22 at the Foleshill Union Shelter. Buried in the communal grave at London Road Cemetery, Coventry. Born 1919 London. Son of Franz X Amrein and Emily G J McDonald. Resided at 14 Kildare Terrace, Bayswater London W2. Died at Gulson Road Hospital Coventry in the April Raids 11/04/1941 Aged 22. Buried Chiswick Cemetery. Born 25/12/1856 Allesley. Wife of Henry Cramp Angliss a Watch Finisher (married 1899). Mother of William Henry Angliss King, Frederick Angliss King, Gertrude King, Minnie King, Frederick King and Elsie King. Resided 51 Castle Street, Hillfields. Housewife. Died from injuries received 08/11/1940 Aged 84. Buried London Road Cemetery Coventry. Born 22/08/1894 Crewe, Cheshire. Daughter of Edward Freeman Winby and Louisa Stevenson. Sister of Edward Stevenson, John Henry and William Fowke Winby. Wife of George Percival Angus of 116 Radford Road, Coventry. Mother of John W and Gerald G Angus. Resided 188 Radford Road, Radford, Coventry. Housewife. Died from injuries received 23/11/1940 Aged 46 Stratford Hospital, Old Stratford. Buried Evesham Road, Stratford. Born 23/03/1903 at Wolverhampton. Daughter of Charles Richard Cox and Elizabeth Day. Wife of Albert Appleby. Mother of Audrey Agnes Appleby. Resided 2 Fowler Road, Radford. Killed in the April Raids 09/04/1941 Aged 38 at 2 Fowler Road, Radford. Buried in the Communal Grave, London Road Cemetery, Coventry. Born 25/08/1924 at Wolverhampton. Daughter of Albert Appleby and Agnes Cox. Resided 2 Fowler Road, Radford. Employed L.H. Fearis, Confectioner. Killed in the April Raids 09/04/1941 Aged 16 at 2 Fowler Road, Radford. Buried in the Communal Grave, London Road Cemetery, Coventry. Born 11/09/1898 Coventry, Warwickshire. Son of James Archer a Foreman Weaver (Retired) and Clara Barrett of 247 Kingfield Road, Foleshill, Coventry, Warwickshire. Husband of Lily Aston. Employed as an Artificial Silk Worker at Courtaulds Limited. Air Raid Warden. Killed in the Coventry Blitz 14/11/1940 Aged 42 whilst on duty. Buried in the communal grave at London Road Cemetery, Coventry. Born County Durham. Son of Mr and Mrs W.M. Archer of 17 Rutherglen Avenue, Whitley. Husband of F Archer. Resided at 649 Sewall Highway, Courthouse Green. Works Fireman employed at Armstong Whitworth Limited. Killed in the April Raids 10/04/1941 Aged 27 at 649 Sewall Highway. Buried London Road Cemetery Coventry. Born 07/07/1907 at Fillongley, Warwickshire. Son of Abel Arthers and Charlotte Annie Dance of Corley. Husband of Lillian Eliot Taylor of Cromer, Bennetts Road, Keresley. Wages and costs clerk (Motor Factory). Injured in the April Raids 09/04/1941 and died the same day at Coventry and Warwickshire Hospital. Buried in the communal grave at London Road Cemetery, Coventry. Born 09/1927 at Southam. Daughter of William Thomas Arrowsmith and Florence Harris. Sister of Stanley A and Albert J Arrowsmith. Resided 135 Cambridge Street. Attended Wheatley Street School. Killed in the April Raids 08/04/1941 Aged 13 at 135 Cambridge Street. Buried in the communal grave at London Road Cemetery, Coventry. Born 04/06/1900 at Coventry. Daughter of Edward Harris and Mary Ellen Stott, of 4 Queen Street. Wife of William Thomas Arrowsmith. Mother of Constance Mary, Stanley A and Albert J Arrowsmith. Resided 135 Cambridge Street. Housewife. Killed in the April Raids 08/04/1941 Aged 39 at 135 Cambridge Street. Buried in the communal grave at London Road Cemetery, Coventry. Born 11/11/1898. Employed Daimler Number 2 Factory, Sandy Lane. Son of Joseph Arrowsmith and Laura Taylor, of 85 Lockhurst Lane, Foleshill. Husband of Florence Harris. Father of Constance Mary, Stanley A and Albert J Arrowsmith. Resided 135 Cambridge Street. Killed in the April Raids 08/04/1941 Aged 42 at 135 Cambridge Street. Buried in the communal grave at London Road Cemetery, Coventry. Born 08/12/1912 at Banbury. Son of Mr and Mrs Robert Ashby of Thorpe Lane, Wysall, Nottinghamshire. Husband of Maud. Resided at Crosbie Road. Employed at Humber Limited. Member of the Coventry Auxiliary Fire Service. Killed in the Coventry Blitz 14/11/1940 Aged 28 whilst on duty in Broadgate. Buried London Road Cemetery, Coventry. Born 21/08/1900 Clay Hill, Bushey, Hertfordshire. Son of Robert Ashby and Annie How of Thorpe Lane, Wysall, Nottingham, Nottinghamshire. Husband of Fanny Amelia Olive Tibbitts. Resided 112 Yelverton Road, Coventry Warwickshire. Builder's Labourer. Injured in the April Raids 08/04/1941 at 112 Yelverton Road, Coventry Warwickshire. Died 09/04/1941 at Warwick Hospital. Buried in the communal grave at London Road Cemetery, Coventry. Born 16/04/1920 at Bedworth. Daughter of Wallace Ashman and Jane Burns of Moira, Coventry Road, Bulkington. Sister of Elizabeth O Ashman. Employed British Thompson Houston Limited. Killed in the August Raids 28/08/1940 Aged 20 at Stoney Stanton Road. Buried Bedworth. Born 1908 Coventry. Son of Joseph Ashman and Sarah Susannah Debney. Husband of Hetty Widdowson. Accountant. Resided 107 Bridgeman Road. Killed in the October Raids 21/10/1940 Aged 32 at 105 Bridgman Road. Buried London Road Cemetery, Coventry. Born 12/03/1881 Coventry, Warwickshire. Daughter of William James Smith and Ada Berry. Wife of George James Atkins. Resided 16 Queen Street, Coventry, Warwickshire. Housewife. Died in the April Raids 09/04/1941 Aged 60 at 1 Norton Street, Coventry, Warwickshire. Buried in the communal grave at London Road Cemetery, Coventry. Born 16/07/1897 Coventry, Warwickshire. Son of Joseph Atkins and Ann Eaves. Resided 99 Sussex Road, Coventry, Warwickshire. Husband of Amy Maud Harper. Machine Tool Fitter at Alfred Herbert Ltd. Killed in the Coventry Blitz 14/11/1940 Aged 43 whilst on duty near Swanswell Pool as a Leading Fireman, Auxiliary Fire Service. Buried in the communal grave at London Road Cemetery, Coventry. Born 1895 Aston, Birmingham. Daughter of Alfred Austin and Mary Ann McCarthy. Sister of John Alfred, Eliza Marion (Davitt) and Doris Mary Austin 1905-1949. Resided at 22 Union Street, Coventry. Killed in the October Raids 22/10/1940 at the Queens Hotel Vaults in Gray Friars Lane Aged 45. Buried London Road Cemetery, Coventry.